The Parish Church of All Saints’ Westbury is the oldest building in the town, dating back to the mid-1400s. It is an important community space where major events such as baptisms, weddings and funerals take place. It is also a space where community celebrations such as the increasingly popular Christmas Tree Festival are held and concerts by the Westbury Choral and Westbury Festival take place. It is open everyday for people to light a candle, say a prayer or just have a few minutes peace in a beautiful building. Maintaining this ancient Grade 1 listed building comes at a considerable cost and is the responsibility of the 200 or so members of the Church. The Church receives no money from Government and is a registered charity. 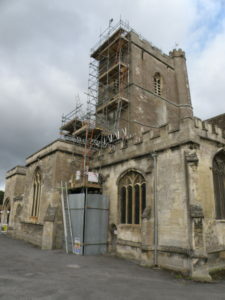 The Church is currently undergoing repairs to the parapet gutter of the tower and many may have noticed the scaffolding erected to allow these works. Unfortunately, when the gutter was dismantled it was discovered that five of the six supporting beams have rotted at the load bearing ends. The beams have been jacked up and stainless steel supports are being manufactured to carry the loads. This unexpected additional work has doubled the anticipated cost to around £77,000. The Church has been able to obtain some small grants, but the bulk of the expenditure needs to be found by the Church community. The members of All Saints are urgently asking for your support to help fund this work so that this architectural gem remains at the service of the whole community of Westbury. If you can help with a donation towards the cost of this work please contact the Churchwarden, John Prince at johnprince2003@aol.com. Copyright © 2019 White Horse Team Ministry.